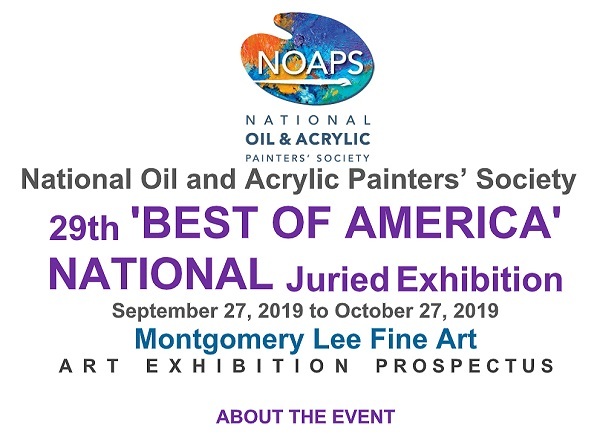 Celebrating its 29th“Best of America” National Juried Exhibition, the National Oil & Acrylic Painters’ Society (NOAPS) invites oil and acrylic painters from all across North America and International Artists to apply to our exhibit honoring the Best in oil and acrylic painting. NOAPS has been showcasing the talents of oil and acrylic painters since 1991. The ‘Best of America’ is a juried competition open to members of NOAPS. All entries will be submitted via Juried Art Services (JAS) www.juriedartservices.com. JAS provides a comprehensive ‘Help’ menu. NOAPS is also available to help with procedural problems. Email: Membership@NOAPS.org for assistance. Digital files should be saved in universal .jpeg format for JAS entry and should be between 1400 pixels and 4000 pixels longest dimension at 300PPI (pixels per inch). Not previously accepted in any other NOAPS Exhibit (including NOAPS National Exhibitions, and Fall and Spring International Online Top 150). Maximum size of the art excluding frame shall not exceed 1200 square inches (Example: 30 x 40 in= 1200 square inches). No Exceptions. NOAPS is dedicated to exhibiting excellent works of fine art which promote the artist’s artistic ability, vision and creativity within the traditional art forms of oil and acrylic painting. In this respect All artwork should be original and created from conception to completion by the artist’s own hand in Oil and/or Acrylic only. Artists are permitted to use their own photos as reference materials in the creation of their artwork. No mixed media, painted giclee prints, or any other type of digital or photographic reproductions in conjunction with the Oil & Acrylic qualify. No artwork copied from other artists work or published photos, or created in an instructional setting are eligible. NOAPS is not liable for any copyright infringement on the part of the entrant and will not become involved in copyright disputes. The annual 2019 NOAPS membership of $50 is required if you are not currently a member pay the membership fee through the membership link at www.noaps.org/join-us or when entering this exhibit. The annual membership is valid from January 1st to December 31st of each year. To verify if you are a current 2019 NOAPS Member, please check our Members Directory Page. https://www.noaps.org/member-directory A 2019 will be listed after your name if you are a current member. Example: maximum of five (5) entries= $70 plus current 2019 NOAPS membership if not already paid. Payment may be made by Pay Pal or Credit Card. Jian Wu graduated from the prestigious Art College of Qing Hua University in China, studying sculpture and mural art. 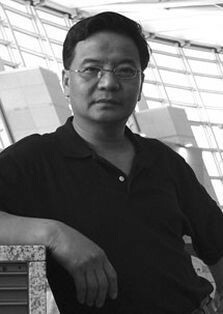 His designs have been exhibited in many of China’s national art shows. He received his Master of Fine Art degree, majoring in illustration from the Academy of Art University. For over 25 years, Jian has been teaching painting and drawing, first at the Academy of Art University, and later at the Ohlone College in Fremont. Currently, Jian works on his art full-time. Jian has garnered many awards for his work including Third Place in NOAPS 1st Best of America 2018 Small Painting Exhibition, Exceptional Merit Award in the International Portrait Competition 2015, Best Portrait in NOAPS Best of America 2010 and Best of Show in NOAPS Best of America 2008. Jian is a Master Artist member of the National Oil and Acrylic Painters’ Society and a signature member of the Oil Painters of America. His works have been collected throughout the United States and worldwide. These TOP Qualifier Awards will be clearly identified as Masters Qualifier Awards before the start of the Best of America Exhibit. They include Best of show, 1st, 2nd, and all “Best of” category awards. With 2 Nationals per year, there will be 10 opportunities in a 5 year period to qualify for Master. Upon approval of the Masters jury submission committee and Masters designation is received, the awarded artist may use the initials NOAPSM on original works of art and in their correspondence. This honor is awarded for life, unless forfeited by nonpayment of annual dues or resignation. NOAPS strongly recommends Strong Boxes from Airfloat Systems or Masterpak. (Airfloat is a NOAPS Sponsor and they provide a 20% discount to NOAPS members). Similar shipping containers can also be accepted. All art received and displayed will not be returned until after the exhibit has closed. The gallery has 30 days after the close of the show to return unsold artwork. If the artwork is sold after acceptance but before shipping it to the exhibit, commission should be paid to the art gallery. Selected paintings will be showcased on www.NOAPS.org, in the NOAPS Blog, and in NOAPS Social Media. By entering, entrants are consenting to having a reproduction of their work used for promotion of the NOAPS Exhibits. You are confirming the work entered is your own and copyrighted images incorporated in your work have not been used. HOW TO Create a return shipping label - example - If using UPS - Must open an account with them, then use their online program to "Create a return" - Enter all the information and print the label but do not schedule a pickup. Enclose return label in envelope for the gallery. There are no charges until the shipping company driver picks up the parcel and scans the shipping label. ***Artwork will not be displayed if Return Label is not provided. $25 check made payable to Montgomery Lee Fine Art for unpacking/repacking fees. Hand deliveries must also include a $25 handling fee. IMPORTANT: Shipping from OUTSIDE the USA must be shipped FREE DOMICILE or they will not be accepted. International artists please check all shipping restrictions and custom regulations before entering this exhibit. All Duties and Taxes must be paid by the artist. Workshop & Opening Week Program: September 24, 25 & 26th, 2019: Painting the Portrait with Jian Wu, Judge of Awards.